The 41st National Games begins! 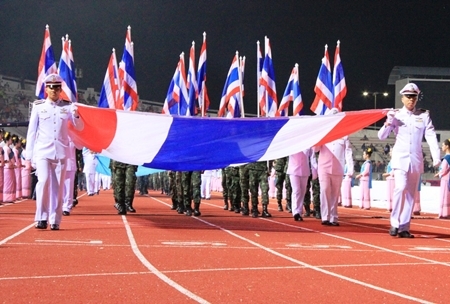 The Flag of Thailand led the parade of athletes from 77 provinces at the grand opening of the 41st National Games. The 700 Years Stadium was the scene of the opening ceremony for the 41st annual National Games on December 9, 2012. Deputy Prime Minister and Minister for Sports and Tourism Chumpon Silpa–Archa joined Chiang Mai Governor Tanin Subhasaen and President of the Provincial Administrative Organization Boonlert Buranupakorn at the opening ceremony that saw more than ten thousand people attend. The show began with a marching band and student stunts. 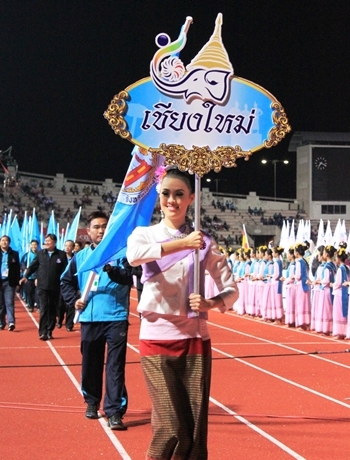 Then a Lanna performance followed by the parade of the flag of Thailand, the flag of Chiang Mai Province and the flag of the 41st National Games followed by athletes from 77 provinces nationwide. Many beautiful traditional Lanna performances kept the crowd entertained on one of the first truly cold nights this year. Chiang Mai was honored by the Sports Authority of Thailand. National competition to host the 41st National Games “Chiang Mai Games” which will run until December 19 with 43 sporting competitions hosted at the stadium and other venues around town. Chiang Mai will also host the 31st National Disability Games or “Wiangping Games” from January 15-16, 2013. 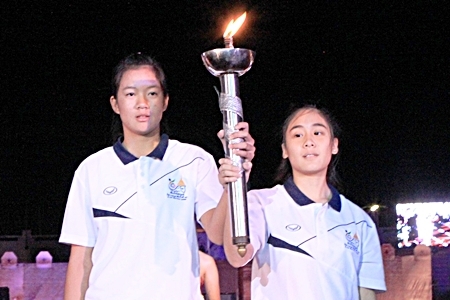 Athletes handed the torch off to Governor Tanin Subhasaen. 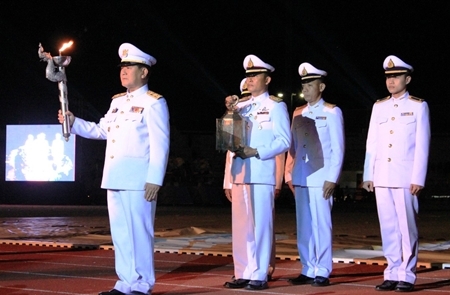 Governor Tanin Subhasaen received the torch to light the flames starting the National Games. on in Chiang Mai until December 19, 2012. 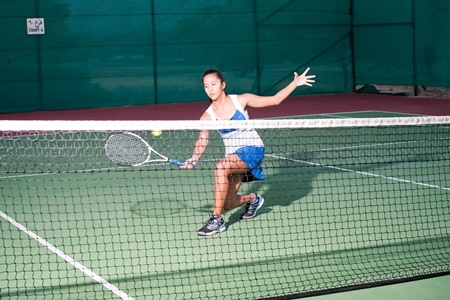 Darran’s top student, 14 year old Sumitra ‘Dear” Basnyat has shown great promise in tennis. This is a question that over the years I have been asked often but unfortunately there is no exact answer. Much depends on concentration and the natural coordination of the child in question; after all, every child is unique. What I will say is tennis, with the advancements in technology, has allowed many more children with lower coordination skills the ability to be able to successfully play. When a beginner first comes to me the first three things I assess and look to implement are coordination, concentration and control. The coordination can be assessed with throwing and catching exercises. To be able to catch and throw is so important since it’s the fundamental ingredient of many sports. You are looking to see if they watch the incoming ball and can catch and pass. Some parents when they see their young child struggle with this can quit citing it is pointless and they will do it later. This is a big mistake, when children are young they generally don’t get too down and they have friends who tend to support and encourage. As they get older the teasing can begin and they become far more self conscious and are far more susceptible to quitting. Learning these basic skills young sets them up well for future endeavors regarding many sports. The concentration element varies greatly with the personality of the child and the variables of teaching style and how much the kid really wants to play. Some can play as early as 4 or 5 years of age but by age 6 the majority of children can play with a degree of success. After the coordination has reached an acceptable level and you have a satisfactory degree of concentration then it is time to tackle control. There are many basic exercises to assess control. When you have control you will feel more relaxed and comfortable with the ball and your aim is to feel this way all the time. Many of the exercises we ask the kids to do are done on their own to show us that they can execute them successfully, the exercises may look basic but they’re so important. If you see a coach hitting basic with a young one it can sometimes not be a true reflection on the child because coaches can put the ball on the strings of a partner, making anyone appear better than they may actually be. If you see two children, even if it looks more basic it is a far more accurate guide of how good they are. Having this control base will give you a feeling of being able to put the ball where you want, and at the speed you want. If you have developed the control to put the ball where your partner wants or needs it, you then naturally also have the ability to put the ball where they don’t want it, thus giving you the skill base to move your opponent into many awkward areas during play. This comfortable feeling with the ball then gives the perfect foundation to start to develop techniques of how to hit strokes more smoothly and less stressfully. A key point to add is at a young age playing and enjoying a variety of sports is advised and because racquet sports tend to be quite unbalanced things like swimming, bike riding, horse riding and generally anything more balanced is advised to even things up a bit. Tennis; what is the best age to start your child with sport?